One-half of the #AlDub love team took the FHM Man Test and made us #KiligPaMore! Here, FHM Philippines plucked Alden Richards from his 'Kilig Pa More' family and made him take his manliest test to date. Have you ever worn briefs on top of your pants and pretended to be a superhero? Yes! I think most guys did that when they were kids. Which fictional villain scares you the most? Si Freddy Kruger. Siya ang nagbigay sa akin ng takot sa pagtulog. If the world were to end tomorrow, what would your last meal be? Isang buong brazo de mercedes na cake, all for me. I love sweets! I’d kill myself with desserts. Have you ever had blood in your hands that was not yours? Yes. I was helping my grandmother cook catfish. You have to cut through its lips, and that can get very messy. Would you ever carry your girlfriend’s purse at the mall if she asked you to? Yeah, for a while. Baka kasi may gagawin siya or kung magsusukat siya ng damit, I’ll definitely hold it for her. If you could blow up thing, what would it be? My bank account, maybe? Ha ha! I’d blow up my life in a good way—to make it bigger and happier! Have you ever been on the receiving end of fart bombs? What’s the longest you’ve gone without changing shirts? Kapag nasa taping…about two days? Have you ever taken secret selfies? Yeah, I do, and I’m not ashamed of it. Pero mostly as a mirror to check my face. What’s the weirdest title of a horror flick you’ve seen? Oculus, which means an eye-like opening. What’s the name of the coolest pet you’ve ever had? Bibe. I had a pet duck before, and I think it’s pretty cool. What’s the worst thing you were teased about as a kid? Being gay, because I am so white. Which romantic comedy makes you feel giddy inside? 50 First Dates. Kahit comedy siya, the effort to make Drew Barrymore’s character— who suffers from short-term memory loss—happy every single day, and remember her relationship with Adam Sandler’s character is very sweet. Effort pa more, kilig pa more! Can you name one high-ranking FHM Babe you’ve had an unforgettable experience with? Jennylyn Mercado. Makulit siya, fun to be with! Pero pag nag-po-pose kasi si Jennylyn sa magazine, makikita mo yung ibang side ng personality niya. Forget the score—only a real man will admit to having a pet duck named Bibe! 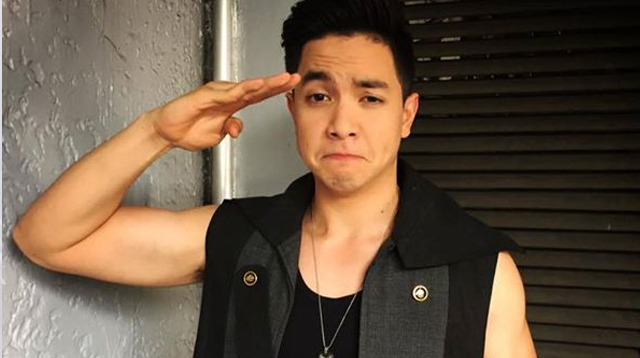 This Alden Richards interview is part of FHM September 2015's TV Special. Grab a copy now! You can also score digital copies through the FHM app on the Apple App Store (http://bit.ly/fhmphapple) and on Google Play (http://bit.ly/FhmPHandroid) and the Summit Media Newsstand (http://bit.ly/fhmmagph)!